SAINT LEO – The No. 9 Saint Leo Lions rolled over the Alabama-Huntsville Chargers 23-12 on Saturday in University Turf Stadium. The Green and Gold whipped up 12 goals in the first quarter alone on their way to their season-opening victory. “You can’t be disappointed with a 23-goal opener,” said head coach Brad Jorgensen. The Saint Leo (1-0) offensive attack was led by junior attack man Philip Buque with five goals and one assist. Charlie Kurtenbach, Ethan Ticehurst, and Devin Sparks each tallied hat-tricks. Kurtenbach handed in seven points with four assists added to his day. As a unit, the Lions put together three three-goal runs topped by a four-goal streak in the opening quarter. Alabama-Huntsville (0-2) saw Luke Levette produce six goals off 13 shots. Between the iron, Zak Welsh earned 14 stops for the visitors. The Lions return to University Turf Stadium on Monday, Feb. 11 at 7 p.m. to host the Notre Dame De Namur Argonauts. 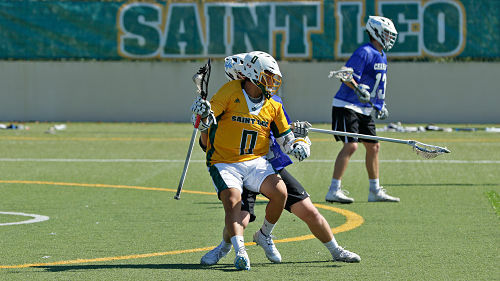 For the latest news, updates, and information on the Saint Leo men’s lacrosse, be sure to visit SaintLeoLions.com. Fans can also stay up-to-date on the latest Lions news by following Saint Leo Athletics on Facebook, Twitter, Instagram, and YouTube.